For a lesson in humility, look no further than Jesus. In the book of John, chapter 13, we find Jesus showing us the perfect example- the Son of God humbled himself to serve each of His disciples by washing their feet. It’s important to have a prayer life. In Matthew 6:5-18, Jesus teaches us the to do’s and not to do’s of prayer and supplies us with a model prayer, telling us to pray in that manner. God longs for us to seek His face. Many times our prayer life consists of maybe 10% of thankfulness (if that), and 90% of asking. We rarely set aside time for seeking, although the Bible clearly tells us in numerous places that we are to seek! Isaiah 55:7 encourages the wicked to forsake his way. God cannot hear us if we refuse to turn away from that which is wicked and not of or like God. These 4 steps are so simple that if there is anything blocking us from heaven, it’s because we’re making it too hard. 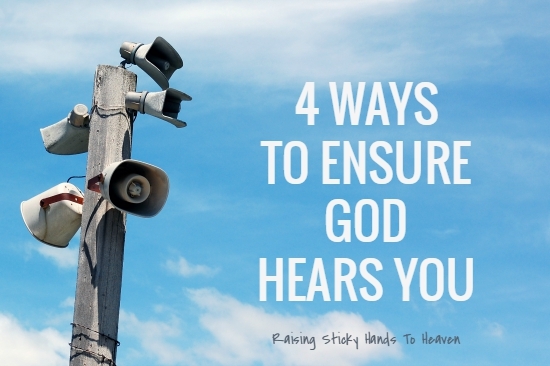 How do I know that these 4 steps will guarantee God’s ear? 2 Chronicles 7:14 tells us step by step what our part is and when we do our part, we find an amazing promise of results. Not only will God hear us, but He will also forgive and heal! So you want to be heard? Yes. It’s really that simple. *All definitions taken from the Merriam-Webster dictionary app.